Taking its inspiration from Ebert’s own critical methodology as set forth in his new book Awake in the Dark: The Best of Roger Ebert, Tara Ison’s review for the L.A. Times balances her critique of Ebert’s work “between the bottom line and the higher reaches, between the answers to the questions (1) Is this worth my money? and (2) Does this expand or devalue my information about human nature?” Her answers? (1) Yes, this is a meaty and comprehensive collection of over 40 years’ worth of impassioned film writing—not merely reviews but profiles and essays as well; and (2) Yes; Ebert indeed expands our knowledge of human nature through his incisive analysis of the 20th century’s (arguably) primary form of artistic expression, of its evolution and its lure. If Ebert’s book can live up to his own stringent standards you know it’s got to be good. Ebert’s masterful blend of entertaining and intelligent essays on everything from Star Wars to Meryl Streep is truly an indispensable chronicle of the American cinema since the late 1960s. . . .
Chicago poetry lovers will have a difficult choice to make tomorrow: Bernstein or Sereni? The work of both poets will be featured in events the evening of Thursday, November 30. Language poet Charles Bernstein, author of over 30 books, including Girly Man, My Way, and With Strings is one of the most important figures working in the genre. He will be at the University of Chicago for a reading at 5:30 pm Thursday night in Rosenwald Hall, room 405, 1101 E. 58th Street. He will lecture on Friday at 1:00 pm in Classics, room 110. In preparation you can check out some Bernstein writings, including "Report from Liberty Street" and "Against National Poetry Month as Such". Meanwhile downtown, Peter Robinson will present his English translations of the works of Italian poet Vittorio Sereni—one of the most important avant-garde Italian poets of the twentieth century—collected in the volume The Selected Poetry and Prose of Vittorio Sereni: A Bilingual Edition. The event will take place at 6:00 pm at the Italian Cultural Institute, 500 North Michigan Avenue, Suite 1450. Choose your poetics, choose a poet, you must choose. . . . In 1909 Daniel Burnham authored The Plan of Chicago—a work that would prove to be one of the most important and influential documents in the history of urban planning. A lavish tome that re-imagined not only Chicago but urban space generally, it included proposals for many of Chicago’s lakefront parks and roadways, the Magnificent Mile, Navy Pier, and other distinctive features of the city. But what lead up to its creation, and what were the factors influencing Burnham’s revolutionary ideas? Enter Carl Smith’s new book The Plan of Chicago: Daniel Burnham and the Remaking of the American City. 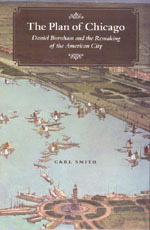 As noted by a recent review in the November 24 New York Sun Carl Smith’s new book is “a concise, splendidly accessible, and beautifully constructed introduction to seminal work of American urban planning and its enduring influence on Chicago and other American cities.” Praising Smith’s incisive take on Burnham’s work the review continues: “ writes particularly well, without padding or academic jargon, and admirable self-restraint: He tells us just enough about the men and the times that created The Plan of Chicago to make us want to learn more on our own. One can offer no higher praise for a writer.” . . .
What do public sculptures and murals have in common with sidewalks and trash cans? In New York, none of them can occupy city property without the approval of a single municipal agency. This colorful history of that agency, the Art Commission of the City of New York, tells the century-long story—involving artists, architects, business leaders, activists, and politicians—of how it shaped the way the entire city looks today. A former vice president of the ACNY, Michele Bogart narrates its history from an insider’s perspective, tracing the commission’s activities from its 1898 founding as an outgrowth of progressive reform to its role in New York’s reconstruction after 9/11. 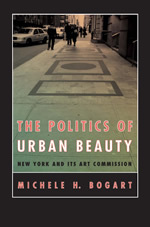 Drawing readers into the center of an art world that paralleled—and sometimes unpredictably intersected with—the more familiar realm of prominent architects, painters, galleries, and museums, The Politics of Urban Beauty tells a quintessentially New York tale that’s of utmost relevance to cities everywhere. Read the press release. . . .
One of theater’s most enduring and perennially fascinating characters, Shylock was a breakthrough for Shakespeare, an early realization of the Bard’s power to create dramatic voices that speak for hidden, unconscious, even inhuman impulses—characters larger than the plays that contain them. But what explains the strange and enduring force of this character, so unlike that of any other in Shakespeare’s plays? Kenneth Gross posits in this daring and revisionist book that the figure of Shylock is so powerful because he is the voice of Shakespeare himself. 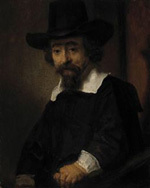 Read the press release for Shylock Is Shakespeare. . . .
As part of their 400th anniversary celebration of the birth of Rembrandt, the Jewish Historical Museum in Amsterdam will host “The Jewish Rembrandt“—a collection of the Dutch artist’s works that deal with Jewish themes. Rembrandt is popularly thought of as having a special affinity for Judaism, but this exhibition promises a more critical and in depth look at the impact of Jewish religion and culture on his work than ever before. The exhibit runs until February 4, 2007. But even if you can’t make it to Amsterdam, Steven Nadler’s new book Rembrandt’s Jews is a revealing exploration of Rembrandt’s work along similar lines. In his elegantly written and engrossing tour of Jewish Amsterdam, Steven Nadler tells us the stories of the artist’s portraits of Jewish sitters, of his mundane and often contentious dealings with his neighbors in the Jewish quarter of Amsterdam, and of the tolerant setting that city provided for Sephardic and Ashkenazic Jews fleeing persecution in other parts of Europe. Through his detailed analysis of the Rembrant’s work, as well as that of several other prominant Dutch painters, Nadler is able to build a deep and complex account of the remarkable relationship between Dutch and Jewish cultures in . 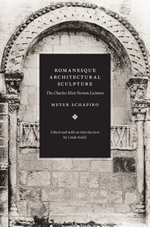 . .
A towering figure in twentieth-century intellectual life art historian Meyer Schapiro (1904-96) profoundly influenced the study of everything from twelfth-century sculpture to modern painting. He made his name as a young scholar, though, by helping to define and elevate the singular style of art known as Romanesque, and it was to the Romanesque that he returned when he was invited to deliver the prestigious Charles Eliot Norton Lectures at Harvard in 1967. In a labor of love, Linda Seidel—who attended Schapiro’s Norton lectures and came to know him through her own work—spent years transcribing and editing the originals to produce this long-awaited, handsomely illustrated volume. Combined with Seidel’s illuminating introduction placing these works in context and telling the story of their long journey to publication, Meyer Schapiro’s Norton lectures provide exciting new paths toward comprehending the depth and breadth of the master scholar’s original vision. Read the press release. . . .
How can a building speak? Look, through Anthony Alofsin’s eyes at Budapest’s Royal Postal Savings Bank: its technologically advanced construction says modern no less clearly than the spoken word, while its references to Hungarian folk culture proclaim its historical roots. 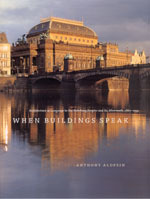 Revealing how such visual languages can express the conflicted identities of entire nations, in When Buildings Speak Alofsin leads readers on a lavishly illustrated tour of overlooked architectural brilliance. Featuring more than 150 color photographs specially commissioned to highlight the neglected yet rich architecture of Central Europe—from national theaters and crematoria to apartment buildings and warehouses—this study offers a new understanding of how people in the Austro-Hungarian Empire and its successor states expressed their cultural and political autonomy by tapping into the limitless possibilities of art and architectural styles. Read the press release. . . .
Nadia Abu El-Haj is an assistant professor in the department of anthropology at Barnard College. She previously taught here at the University of Chicago where she was affiliated with the Center for Middle Eastern Studies. Before her position at Barnard she was in residence for a year at the Institute for Advanced Study at Princeton. Nadia Abu El-Haj is coming up for tenure. Typically the process of granting tenure receives no public input or scrutiny. 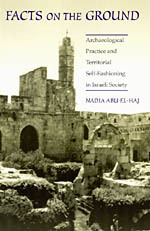 But these are unusual times for some scholars in Middle Eastern studies; Abu El-Haj has received a good bit of public criticism over a book that we published five years ago, Facts on the Ground: Archaeological Practice and Territorial Self-Fashioning in Israeli Society. With the support of partisan groups, Barnard alumnae are being urged to write letters to the president of Barnard in an effort to deny Abu El-Haj tenure. Very few people who get swept up in such crusades ever bother to read the material in dispute. Here’s a place to start: An excerpt from Facts on the Ground: Archaeological Practice and Territorial Self-Fashioning in Israeli Society by Nadia Abu El-Haj In 1971, Amos Elon, an Israeli journalist, first wrote of “the extraordinary appeal . 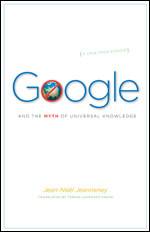 . .
Jean-Noel Jeanneney’s Google and the Myth of Universal Knowledge is a startlingly incisive diatribe against the Google Library Project—Google’s initiative to digitize and electronically distribute the holdings of several of the world’s major libraries. Yet, as several recent reviews have noted, standing in the way of Google’s multi-billion dollar enterprise is not likely to make you popular—or rich. Writing for the Philadelphia Inquirer Carlin Romano praises Jeanneney’s subversive project remarking that Jeanneney provides “a take on world Googlization that you’re not likely to get from your broker.” And indeed David Ng writing for Forbes magazine seems to agree when he writes: Every conversation needs at least two voices. This slim volume…provides a crucial dissenting opinion in a world where the mere mention of Google (or, rather Google’s money) can act as a conversation ender. The Google war chest has all but secured dominance over smaller library efforts, like the author’s own project to digitize the French National collection. History judges societies by how they treat their most disadvantaged members. This book asks only that the Google economy be held to the same standard. Shedding new light on the darker side of Google, Jeanneny’s book is a timely and important comment . . .